So games can save the world, eh? The notion sounds hokey and ridiculous and, while I have been involved with some of Jane McGonigal's online initiatives, I was a bit sceptical about how this book would read. However, a number of people whose opinions I respect, have been enthusiastically promoting this book, and so I placed an order and here we are. I needn't have worried. In fact Jane proves herself to be a more than able communicator of this extraordinary thesis. Yes, reality is broken. You may not realise it, but you know it from the moment you face another grey Monday morning to the indeterminate period when you are drawn by the prospect of Friday evening. Yes, games can fix that reality. Games are already what makes that reality bearable as it is. Going to work by public transport? Look around you. Note the number of people looking at their mobile devices. It's nothing new. Herodotus gives an account of how the ancient Lydians set aside alternate days for dice games in order to take their minds off a devastating famine. 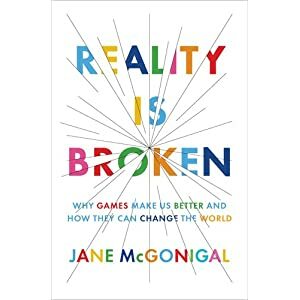 Moving to the present day, McGonigal cites the astounding number of man hours that people invest in playing 'Worlds of Warcraft' alone, and wonders how all this creative activity could be harnessed to actually solve the real-life problems that lead to this escapist behaviour. What follows next is an investigation of what makes for a good game (and not just computer games). McGonigal draws on her own experiences of designing and playing games to illustrate features that make a game that is engaging. The book moves from traditional shoot 'em ups, through to puzzles. From solitaire to MMORPG. We are introduced to the buzz of an epic win (and the engaging thrills of 'epic fails' as well!) . All the while, the objective is maintained, until we are introduced to games that actively try to solve a real world problem. The style is engaging and, while the pace may lag a little when describing the mechanisms of individual games the reader may not be familiar with, the examples demonstrate a point that is woven into the overall theme. And what of the Lydians? What happened to them? I recommend you read the book and find out! Labels: review "Reality is Broken"